We are very proud to have been involved in the Larne A8 infrastructure project which has been selected as one of the top ten images in the Royal Institution of Chartered Surveyors (RICS) Infrastructure Photography Competition. Kilwaughter Lime supplied 1000 tonne of asphalt filler to the £130million A8 upgrade, the principal route from Belfast to the major sea port of Larne where a large percentage of Northern Ireland’s freight arrives and departs. The A8 runs from the M2 at Glengormley to Larne is part of the European Route E01. The average traffic level before the double lane improvement project commenced was 18,000 vehicles per day, close to the upper limit for a single-carriageway road. The use of asphalt filler will reduce noise pollution and increase safety and comfort for drivers. 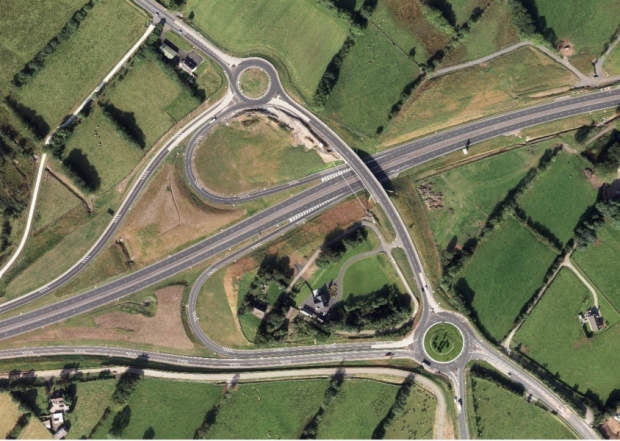 An aerial photograph of the major road intersection has been selected as one of the top ten images in a UK-wide photography competition launched by the Royal Institution of Chartered Surveyors (RICS) to celebrate iconic and important infrastructure schemes. Judges commended this photograph for giving the public an opportunity to see this beautiful area from an angle they wouldn’t normally see it from. Interestingly - and somewhat humorously - the Judges also commented that the outline of the roads bear a striking resemblance to cartoon character, Sid from Ice-Age. Find out more about how our products are used in the industry.